Though born in Michigan and educated at Cornell in New York, Louis Webb made his greatest impact in his adopted hometown of Pasadena, California. Through his work as an engineer, a real estate developer, and an investor, Webb became a millionaire, albeit a frugal one with a philanthropic heart. Behind a rough facade he maintained an idealistic, generous spirit and, specifically, liked giving to the poor, elderly, and children. With these causes in mind, Webb developed a plan to share his fortune with Pasadena forever. 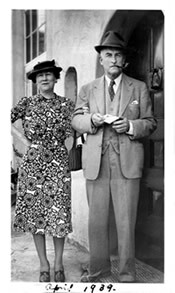 During a rare interview with the Pasadena STAR-NEWS in 1961, Webb outlined his dream to create a community trust: “I wanted to do some good with my money…in some manner that would continue the charitable work after I was gone.” On December 10, 1953, Webb created the Pasadena Foundation, and he and his wife Marion named the Foundation as the beneficiary of their estate – a gift of about $2.5 million. As he hoped, Webb’s fortune and charitable influence live on. Please consider expanding Louis and Marion Webb’s legacy by clicking the donate button below.